From late night toothaches to sports injuries, dental emergencies can happen at any time and to anyone. During office hours, immediate attention will be given to your dental emergencies, and you will be seen as soon as possible. After office hours, please give the office a call and follow the instructions provided. Your call will be returned as soon as possible. If you are experiencing a serious or life threatening emergency, please call 911 or visit the nearest emergency room. – For a knocked-out permanent or adult tooth, keep it moist at all times. If you can, try placing the tooth back in the socket without touching the root. If that’s not possible, place it in between your cheek and gums, in milk, or use a tooth preservation product that has the ADA Seal of Acceptance. Then, get to your dentist’s office right away. – For a cracked tooth, immediately rinse the mouth with warm water to clean the area. Put cold compresses on the face to keep any swelling down. – If you bite your tongue or lip, clean the area gently with water and apply a cold compress. – For toothaches, rinse the mouth with warm water to clean it out. Gently use dental floss to remove any food caught between the teeth. Do not put aspirin on the aching tooth or gum tissues. – For objects stuck in the mouth, try to gently remove with floss but do not try to remove it with sharp or pointed instruments. 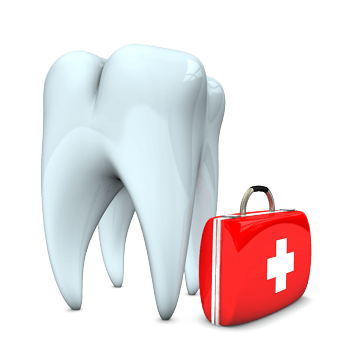 Contact us today to if you have dental emergencies in Centreville, VA. Our experienced dental office in Centreville, VA will answer your all your dental questions. Relaxed Dentistry is your comfortable and convenient dental office in Centreville, VA, providing comprehensive dental services. Dr. Ayas is your top dentist in Centreville, VA, available to treat all dental needs. We look forward to meeting you!